Before it disbanded last month after 72-plus years of serving its community, the Hillsboro Lions Club donated the remaining money in its coffers to several local organizations. Some of those organizations are shown with club members in these photographs. In the top photo, the Hillsboro Youth Football program received a $1,000 donation. 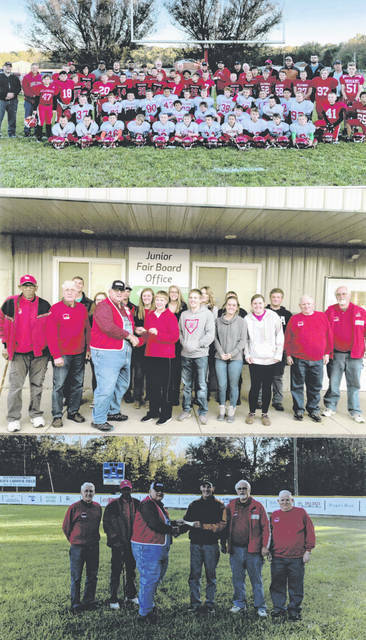 In the middle photo, the Highland County Junior Fair Board received a $6,000 donation. In the bottom photo, Richard Shaffer Park received a $1,000 donation plus a new scoreboard that is visible in the background. In all, the Hillsboro Lions Club donated $23,000 to local groups.